…A kaleidoscopic zoo of gummies! I eagerly accepted (does anyone ever say no? ), and had her root out a red currant coin as I popped the caramel in my mouth. Creamy mint dissolving into warm, butter-rich pool. Without pausing to savor, I tore into the coin, reveling in the teeth-bouncing chew. Freshly sugared and wanting more, I roved the shelves. Apple Pie—brown button-sized jellies infused with apple, nutmeg, and cinnamon and rolled in a crust of crunchy sugar. Champagne Bears—blush colored gummy bears in flavors of brut and rosé. Champagne Bubbles—teeny gumdrops covered in a fizz of white nonpareils; a physical onomatopoeia. I paused at a cube filled with bright pink candies that looked like water-smoothed stones. Aphrodite Strawberries—a sugared strawberry covered in milk chocolate and a crisp sugar shell. This I’d never seen. This I had to have. But, oh! A cube of speckled gray stones—Dionysus Walnuts—suddenly beckoned from the shelf too. I held the two boxes, one in each hand, torn. Sensing my struggle, the woman in the bowtie offered to get me samples of each. Not as fun as a surreptitious taste or three from the bulk bin, but a sample just the same. When she reappeared it was with a small white ceramic tray bearing the two candies, each individually wrapped in cellophane. Delicate crunch of smooth sugar… slow melt of chocolate… burst of berry, syrup-dense and sweet. A bite of Dionysus’ walnut provided a rich and earthy counterbalance. Though both delicious, I ended up selecting Aphrodite’s more exotic offering—kumquat—which had somehow escaped my initial notice despite its speckled orange shell. At the counter, I inquired about one of the treats that had intrigued me because of the faint revulsion I felt looking at it—salted licorice fish. It wasn’t a bulk bin-binge, or Willy Wonka running around knocking enormous gummy bears off of trees and twirling marshmallow mushrooms, but was I ever buzzzzzing on quite the sugar high. 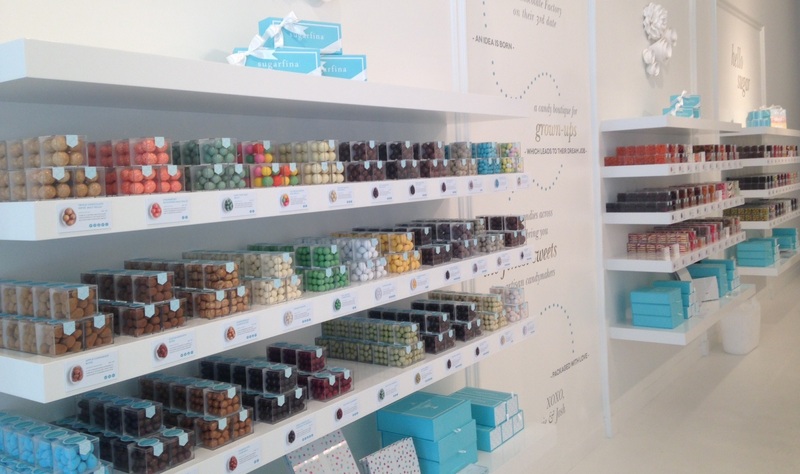 Sugarfina has two San Francisco locations—272 Sutter Street near Union Square, and 1837 Union Street in Cow Hollow. In addition to individual small- and large-sized individual candy cubes, they offer cheeky giftsets and design-your-own bento boxes. 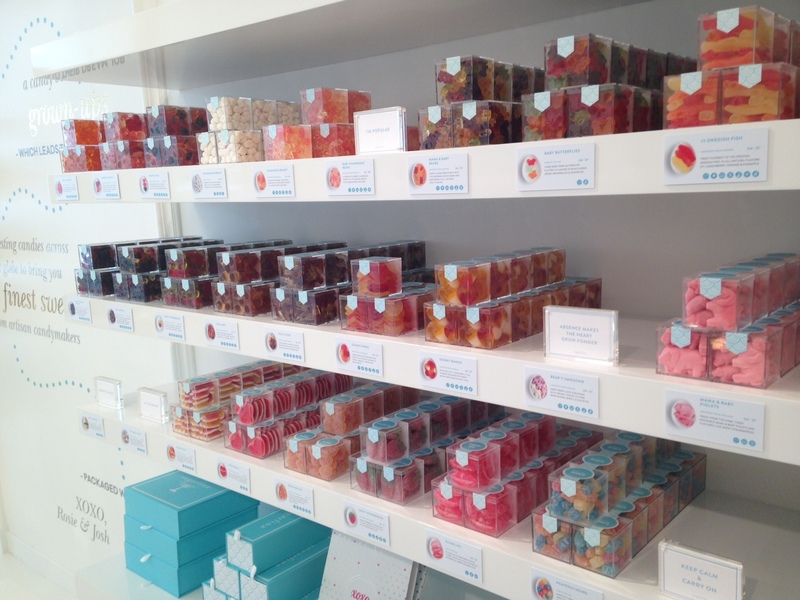 If you’re not in a rush for your sugar rush, you can purchase candy through their online store.